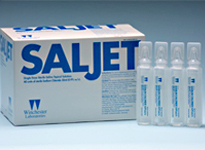 to Saljet, the easiest, most cost-effective solution for small volume sterile saline application. The 5-second solution for small volume saline application. Several strips of Saljet applicators can be carried in the pocket, reducing time consuming trips to the supply room.